The US military has proposed keeping 10,000 troops in Afghanistan after the formal withdrawal of American “combat forces” at the end of this year. Claiming that any lower troop level would not be viable, the Pentagon proposes a complete pullout by next December rather than maintaining fewer than 10,000 soldiers and Marines. The senior US commander in Afghanistan, General Joseph Dunford, presented the proposal to a recent White House meeting of the National Security Council. He argued that 10,000 troops was the minimum force needed to secure strategic bases across Afghanistan. US intelligence and State Department officials seconded the recommendation, according to media reports, insisting that the proposed troop level was required to protect their continued operations as well. The Pentagon is determined to keep control of Afghan bases, which provide the American military with the means of projecting military force against neighboring China, Iran, South Asia and the oil-rich former Soviet republics of Central Asia. “The proposal is 10,000 or basically nothing, a pullout,” an unnamed senior official familiar with the White House discussions told the New York Times . 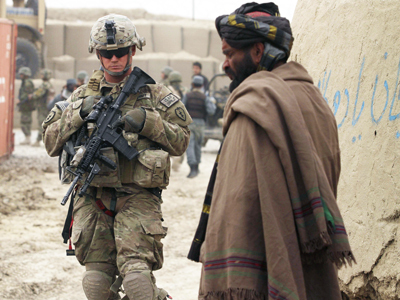 In addition to US forces, some 2,000 to 3,000 troops from NATO and other allied countries would remain in Afghanistan after 2014 under the plan. There are currently approximately 37,500 US troops occupying Afghanistan, along with 19,000 from NATO and allied countries. The number of US troops is scheduled to drop to 32,000 by next month and fall more steeply after Afghan presidential elections set for April. White House spokesman Jay Carney Wednesday claimed that Obama has “not made any decisions about final troop numbers” and “will be weighing inputs from our military commanders, as well as the intelligence community, our diplomats and development experts” before making a final decision on post-2014 troop levels in Afghanistan. Tensions over the issue have risen under conditions of a protracted and increasingly bitter conflict with Afghan President Hamid Karzai over the signing of a bilateral security agreement (BSA), which would set the conditions under which US forces would remain beyond 2014. In particular, Washington demands that the Kabul government grant full immunity to US forces from Afghan and international law, ensuring that they not be prosecuted for war crimes committed in the country. The Obama administration had anticipated that Karzai would sign last November, after a hand-picked, 2,500-member Loya Jirga, or grand council, voiced its approval of the BSA. Instead, the Afghan president, who was installed as a result of the US invasion of Afghanistan, has put off acceptance of the agreement while demanding that the US occupation forces halt night raids and air strikes on Afghan villages. These attacks have claimed a large number of civilian casualties. Karzai is also demanding that Washington get behind peace talks between the Kabul government and the Taliban armed opposition. The first of these points of contention was further inflamed last week by a US air raid on a village in Parwan province that killed two women and five children. It is widely believed that Karzai is postponing any signing of the deal until after the April presidential election in order to maximize his own leverage in determining who will succeed him and ensuring that he continues to wield substantial influence. Further escalating tensions between Washington and the puppet Karzai regime, President Obama last Friday signed into law a spending bill that provides only $1.2 billion in aid to Afghanistan for fiscal 2014, half of what was provided the previous year. News of the 50 percent cut was met in Afghanistan with warnings of a financial catastrophe for an economy that is almost wholly dependent on foreign assistance. Other donor countries are expected to follow Washington’s lead in slashing funds. The World Bank last week estimated the country’s growth rate for 2013 at 3.1 percent, a precipitous decline from 14.4 percent the previous year. The US aid cut has been widely interpreted in Afghanistan as retaliation for Karzai’s stalling on the security agreement. Friction has been further increased by a series of ads broadcast by the Afghan media pushing for a speedy signing of the BSA, with Afghan “man in the street” interviews purporting to show popular support for the deal and, by implication, impatience with Karzai’s delays. The government has intervened to demand that the ads be pulled, and the Afghan attorney general has launched an investigation into their origin. According to TOLO TV, the country’s most popular channel, the spots were paid for by a company called Ads Village, whose funding, in turn, came from NATO’s ISAF occupation command as well as the US Agency for International Development (AID). Two pro-government Kabul newspapers went further, suggesting that the restaurant bombing was the work not of the Taliban, but of Western intelligence agencies attempting to pressure Karzai and create an atmosphere in which the continued presence of US-led occupation forces will be seen as indispensable.